Four-time Oscar nominated director David Lynch is headed to Moscow on April 5 just a day after his David Lynch Foundation presents a World Harmony Concert headlined by Paul McCartney, Sheryl Crow, Eddie Vedder, Donovan and Paul Horn among others at Radio City Music Hall in New York City. The Russian edition of Lynch’s book, Catching the Big Fish: Meditation, Consciousness, and Creativity, a personal glimpse into the influences on his life and work, was released at the beginning of March. Lynch first received Oscar nominations as Director and Best Writing, Screenplay for Elephant Man and further Oscar nominations for Director for Blue Velvet and Mulholland Drive. He also received a Golden Lion award for lifetime achievement at the Venice Film Festival in 2006. Lynch’s surreal Twin Peaks, a cultural phenomena in the West, had additional significance in Russia as one of the first Western television series to be released as the country opened up during the early 1990s. Lynch has also brought his unconventional and distinct approach to work as a painter, photographer, performance artist, composer and cartoonist. He works outside at his Hollywood studio because his current passion is what he describes as “toxic materials.” He also is pre-occupied with a digital Hasselblad camera. 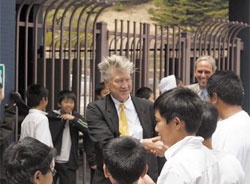 He treats visitors to his website www.davidlynch.com to a daily weather report and has his own organic coffee brand (he reportedly drinks 15 cups a day). Apparently Lynch will be opening two exhibitions in Moscow: Air is on Fire with the Fondation Cartier, and FETISH, a collaboration between Lynch and shoe fashion celebrity Christian Louboutin, at the new Garage Center for Modern Culture. An “Evening with David Lynch” event on Saturday, April 11, a meeting at one of Moscow theater or film institutions and a book signing are also expected during his visit.